June 21st, 2017 | Categories: Celebrity Real Estate. Tags: Harry Styles, Los Aneles home staging, los angeles real estate, Luxury Real estate, and professional home staging. Harry Styles home is for sale. According to Curbed LA, Harry Styles recently listed his Hollywood Hills house for $8.5 million. The house is 4,400-square-foot, and three-bedrooms. Harry Styles’ house features a pool, a home theater, a gym, and views of both downtown Los Angeles and the Pacific Ocean. The modern style abode, though well appointed, currently features a number of custom paint colors throughout that might not appeal to every potential home-buyer. 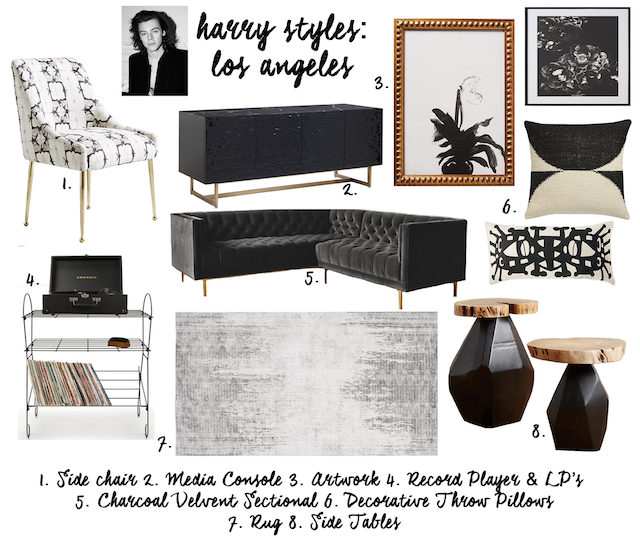 As a result, through an analysis of Harry Styles’ home and a mood-board, I’ll show you how I would utilize home staging to get Harry Styles’ home ready for sale. Custom paint colors, dark and oversized furniture. The home is very modern so I want to create a design aesthetic that is in keeping with the home and the neighborhood’s target home-buyer. The goal is to keep a neutral color palette, maybe something like Dunn-Edwards’ crisp Droplets (DEW 381), while creating a space that incorporates both masculine and feminine design touches. A home with a little edge so as to appeal to the Harry Styles’ home’s target buyer. A neutral color palette in black and white that includes a tufted sofa which is balanced out by the more delicate floral artwork.we bring in different patterns and textiles to keep the design intriguing to potential buyers. With a neutral black and white palette used here, we would bring in different patterns and textiles to keep the design intriguing to potential buyers.